All the advantages of our Mobile Squat Rack (1.91 m) with the added value of a pull-up bar. The Singular WOD mobile squat rack + pull-up baris the perfect complement to your strength and weightlifting exercises with the addition of being able to do gymnastic exercises thanks to the pull-up bar that is included. Our The Singular WOD mobile squat rack + pull-up bar is made from structural steel which gives it great strength and reliability during training. It can withstand up to 250 kg of static load and is compatible with the full range of rack accessories such as plate storage post for racks, triceps dip station for racks and the safety support for racks. In addition, its black stove-lacquered powder paint coating finish makes it very resistant to blows, normal conditions of humidity and changes in temperature. It is very easy to assemble thanks to its system of bolted brackets. Once fixed to the ground, its great stability will allow you to do even kipping or butterfly pull-ups without compromising your safety. Its 2.48 m of height are more than enough for pull-ups, to remove the bar from the rack pre-loaded or clean and for a variety of movements such as overheads or squats. It occupies 1.5 m2 so it will not take up much space and give you more exercise options in your home or in the box. El The Singular WOD mobile squat rack + pull-up bar includes two 50-mm J-Cups so you simply have to assemble and¡train! Important: Anchoring it to the ground for kipping or butterfly pull-ups is essential. Its use in conditions of extreme humidity or rain can produce premature deterioration of the rack that will void the warranty. For more information contact us at info@singularwod.com. Finish: Stove-lacquered powder paint coating. The best way to develop your core. User the GHD to work your glutes, abdomen and lower back and get better in all those exercises that use those muscles. If you want to work your triceps, this is the tool you need. 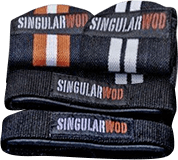 Use it with our Singular WOD rack (except the folding rack). Advanced performance monitor, ergonomic handles and adjustable footrests. Easy installation and storage. Available in Black and White.